I woke up early at the first signs of sunrise to catch daylight breaking on an illuminated Banner Peak. The colors found in a High Sierra sunrise can only be compared to visions I’ve held in the depths of dreams. The air had the faintest chill, but quickly let go with the rising sun. I used my bear canister as a seat, and ate my breakfast with Thousand Island Lake glistening in front of me. Of all the days Julia and I spent on the John Muir Trail, this was the hardest camp to break. As difficult as it was to leave Thousand Island Lake, we knew we had a beautiful day of hiking before us, as well as a chance to resupply at Red’s Meadow. Before we could even get our legs warmed up, we had already passed by two shimmering bodies of water, Emerald Lake and Ruby Lake. After seeing those two, we began a descent down a series of switchbacks and caught our first views of Garnet Lake. We continued down the trail towards the shore of Garnet Lake and took in the views with Mt. Ritter and Banner Peak standing tall in the first hours of the morning. The mild bobbing of the water was hypnotic, as the clouds painted the sky in veiled sheets of white. After a short break to take in the rapturous beauty of Garnet Lake, we continued on the trail that wrapped around it’s edge before heading upward through thick green foliage. There were a lot of tents here with gorgeous campsites, situated on flat patches to take in the views of the lake. Thousand Island Lake was an incredible place to camp, but I’m really looking forward to coming back here to spend the night at Garnet Lake sometime in the future. After finishing the climb away from Garnet Lake, we began a descent through a small meadow and a lightly wooded area. It wasn’t long before we were being drawn to another beautiful body of water in Shadow Lake. Shadow Lake is the perfect spot to stop, relax, and hydrate, as an uneventful series of uphill switchbacks follow shortly after. After finishing the climb out from Shadow Lake, we were greeted by Rosalie Lake. It seemed the views of beautiful lakes just wouldn’t stop for this day of hiking. From Rosalie Lake, the trail climbs a little more before heading down to Gladys Lake. We stopped to filter water and rest our legs at Gladys Lake, as we knew a long march to Devil’s Postpile and Red’s Meadow stood ahead. The Devils Windstorm of 2011 brought down 10,000 trees, leaving this stretch of wilderness looking like a arbor cemetery. It was in stark contrast to the beautiful lakes and lush scenery we began our day with. The walk through this area of downed trees felt much longer than it actually was, luckily we were able to enter Devil’s Postpile National Monument just after 1:00 PM, which meant we weren’t far away from juicy burgers and a resupply at Red’s Meadow. There are a few trail options here that lead to Red’s Meadow, and we chose to take the high ground JMT route as opposed to heading straight down to the monument. For those that haven’t seen the monument before, you can head down to get a look. Otherwise, you can stay on the JMT and get a view of the monument from a distance. There were a lot of people enjoying the resort of Red’s Meadow when we arrived. Many were casual tourists who took the bus from Mammoth Lakes, but there were also a lot of JMT, PCT, and just regular backpackers and thru-hikers. The first thing we did was head over to the grill to grab lunch. I had two cheeseburgers, and Julia enjoyed a grilled cheese sandwich. After lunch, we made our way over to the post office and general store to pick up our resupply buckets. Red’s Meadow offers showers and has a campground, and Julia and I had initially planned on stopping here to take advantage of this. After a few days of hiking, we felt pretty good without needing to cleanup with warm water, and changed our plans. We were also really liking the freedom to pitch a tent in isolation, and didn’t want the congestion and elbow rubbing we were sure to find in another backpacker’s camp. After filling our bear canisters with food from our resupply mailings, we got back on the trail and made our way towards Deer Creek. The sun was pretty hot on this day when it wasn’t obscured by the clouds, as the entire stretch of trail was exposed. This area was completely torched by the Rainbow Fire back in the 90’s, and much of the landscape is made up of a seemingly endless forest of charred stumps. It’s one of those areas where you can really appreciate the beauty of death and rebirth. We continued climbing up a series of switchbacks and started to see signs of the arbor life begining to thicken. The rest of the hike on this day was really pleasant, as shade became abundant, and water sources reappeared. We had our eye on a few camp spots as we looked at our map, but the first two we had in mind were already occupied. We continued to the campsite of Deer Creek, and found a spot not too far from the flowing water. Great updates so far on your trip through the JMT. I really enjoy reading your blog and it’s been a great guide as I explore more hiking around the Angeles National Forest. Amazing photography as well, really considering a mirrorless option now. So many lakes! It really is such a unique and beautiful area. As always, my thanks for sharing! Yes, this was an incredible stretch of hiking for sure! What an utterly jaw-dropping landscape! Thanks for the photos. I miss my walks through the hills of my old home. Being in the Mediterranean in the summertime with children, feels like walking any distance is off the agenda. I look forward to Autumn and hopefully more opportunities for some gentle hiking. Meanwhile, I’ll vicariously enjoy yours! Thanks, Selina! Hopefully you’ll get to start hiking again in the fall! I’m really enjoying these posts. If I ever return to the States, I’ll have to look into checking this trail out. Thanks! You’ll definitely have to add it to your list! Wow again! I see what you mean about Garnet Lake. Thanks for the excellent report and photos. I’m loving the journey. Thanks for reading, Caroline! Garnet Lake is a special place, I can’t wait to visit again. Love reading about your adventure. I don’t blame you for not wanted to leave Thousand Island lake. It is stunning, especially in the morning light. Thanks for reading! I love reading all of your adventures, too! So many lakes.. and Garnet lake is such a beauty could feel the energy here. I guess it’s from the abundance of lakes that the trail got it’s name — Thousand Island Lake. Drew are there actually a thousand lake here? There are a ton of lakes on this leg of the JMT. Luckily, I’m going to be making a return trip to this section over the summer. Another fantastic read. 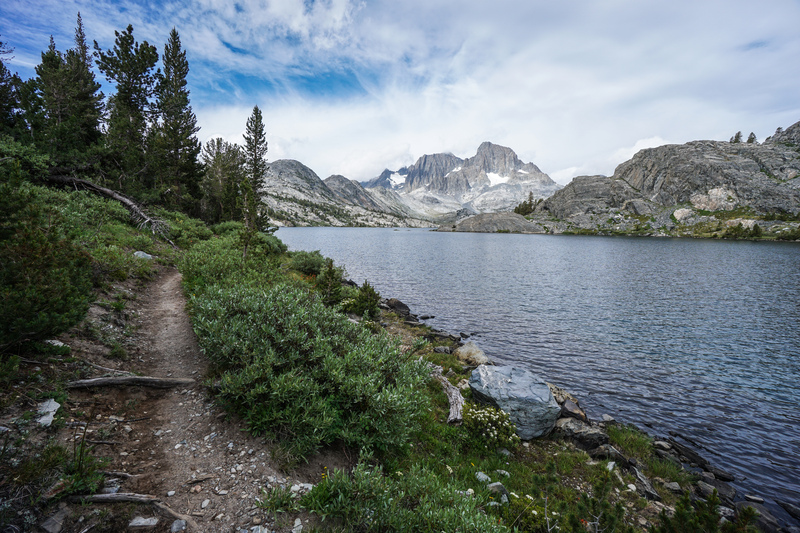 I have always wanted to go hike on the John Muir Trail but I never did it. You have helped inspire me with these posts. I am only on day three here and I can’t stop reading. I love the pictures you capture and the story you tell about this adventure. I never see any wildlife shots though… Are you not crossing any or is it something you just choose not to take pictures of?